Donning a rainbow flag in the rain at a counter protest last Thursday on the corner of Forbes Avenue and Bigelow Boulevard, Hannah Riley said the Westboro Baptist Church’s planned visit to Pitt wasn’t shaping up to be violent. The WBC likes to make noise, but their failure to appear on Pitt’s campus spoke louder than any protest could have — not only did it speak volumes about their priorities, it also gave a stronger voice to the groups counter-protesting on campus. One WBC member in Pittsburgh, Jael Holroyd, tweeted that afternoon to announce the main reason they cut their tour short. “We were soaked with media presence at first event,” Holroyd said, adding that the weather Thursday affected the group’s decision to skip events in Pittsburgh on its schedule later in the day. For those who don’t already recognize how deeply troubling Westboro’s ideology and preaching methods are, Holroyd’s tweet should easily expose the group’s twisted priorities — their thirst for attention and money over sharing their beliefs. If the group’s motive for Thursday’s protest was actually to spread what they believe to be the true word of God, no amount of rain would have deterred them from sharing that message with us. As Holroyd seemed to admit, her group’s real intentions weren’t so much to talk to college students as they were to enrage us and profit from the controversy. The so-called church generates a large part of its income from lawsuits against people and organizations that oppose its right to demonstrate, and media attention goes a long way in helping the group get there. But if the hate group simply hoped to get a rise out of college students at Thursday’s protests, they must have been sorely disappointed. Far from it, Westboro’s visit successfully united students and other community members, loving and supporting one another. The group’s absence also handed the WBC’s self-appointed duty to share their religious agenda over to Christians at Pitt’s counter protests. These Christian representatives came to share who Jesus really is and demonstrated just how hypocritical Westboro’s version of Christianity is. Westboro’s last target in Oakland was religious — St. Paul Cathedral — where four protesters stood holding multiple signs each on the street corner. One counter-protesting man, rosary beads in hand, faced picketers and loudly recited prayers while a Westboro protester shouted at him through police guarding the members of the hate group. Across the street from WBC’s picket at St. Paul’s, local activist Ciora Thomas led the Trans Liberation protest, organized by SisTers PGH. Thomas founded the organization, which aims to serve transgender people of color through outreach and shelter. Standing amid crowds of people who gathered at the corner of Bigelow Boulevard and Forbes Avenue, awaiting WBC’s arrival and showering each other with encouragement, I found it easy to forget that it was raining at all. They came to respect and love their neighbors — and it was powerful. The environment was so encouraging that it’s unlikely there would have been violence even if WBC had appeared. Although police arrested one man at the corner of Forbes and Morewood avenues for attempting to reach and destroy a WBC sign, the vast majority of counter protesters were not violent. And just as protesters appeared unlikely to instigate harm, Pittsburgh police maintained a mostly calm relationship with the crowd for the duration of the event as well. Pittsburgh counter protesters should be proud of themselves for prioritizing each other over the comfort of staying dry. 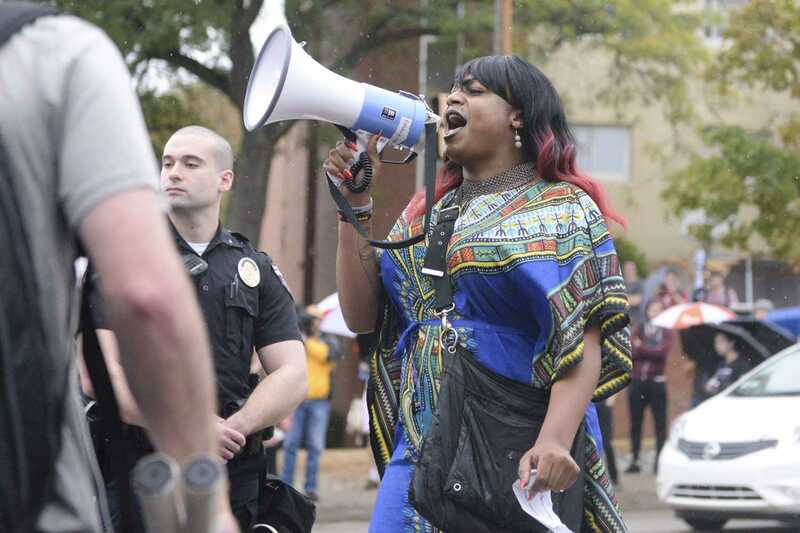 All too often, protesters on college campuses frame situations as adversarial — “us” versus “them.” But since WBC failed to appear on campus Thursday, all that was left were groups of people armed with signs, flags, cookies — united. The hate group eliminated themselves from the equation, and effectively turned what could have been a shouting match between protesters and counter protesters into what was essentially a pride rally. Last week, I urged the University to let our words and actions speak love over a group spreading the opposite. It turns out, we didn’t even have to shout to be heard. The rain helped us fight the battle. Write to Sarah at srs165@pitt.edu.